NOTE: This post was orginally written in December 2016. President Trump announced on July 28, 2017 that Homeland Security Secretary John Kelly was selected to become the White House Chief of Staff, replacing Reince Priebus. President-elect Donald Trump continues to stack his presidential cabinet with military generals, as sources confirmed Wednesday that retired four-star Marine general John F. Kelly will be nominated as Director of Homeland Security. As a former leader of the Southern Command who served time in Iraq, Kelly has extensive knowledge in both of the DHS’ major focuses: immigration and terrorism. Find out more about the former general and likely future cabinet secretary. 1. Kelly is a retired four-star Marine general. Until earlier this year, he headed the United States Southern Command which had him in charge of military operations in 32 countries in the Caribbean, Central America and South America. 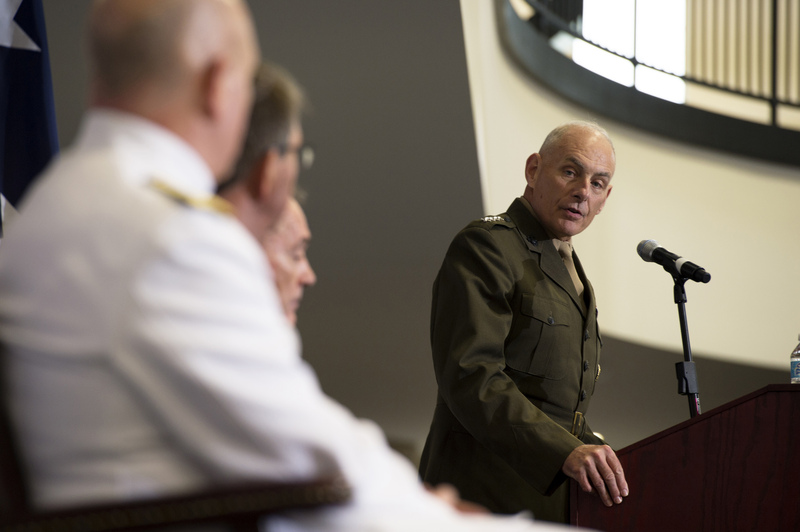 This position is notably less combat-focused than other commands, and as a result Kelly gained experience in humanitarian and disaster relief, as well as programs to train local militaries. 2. Before serving as head of the Southern Command, Kelly played an active role in Iraq. He led troops in intense combat numerous times, and became the first Marine colonel since 1951 to be promoted to brigadier general while in active combat in 2003. 3. Kelly’s son, Marine Lt. Robert Michael Kelly, was killed stepping on a mine while fighting in Afghanistan, causing Kelly to become the highest-ranking military officer to lose a child in Iraq or Afghanistan. Kelly’s loss played a role in Trump selecting him as the Director of Homeland Security, as the President-elect reportedly wanted someone who could understand the personal costs of sending Americans to war. 4. He has occasionally criticized the Obama administration’s military policy, such as trying to close Guantanamo Bay and opening all combat roles to women. He argued that conditions in Gitmo are not as harsh as its opponents have alleged and that the military would be forced to lower its physical standards to allow women in combat roles. 5. As the head of Homeland Security, Kelly would be entrusted to carry out Trump’s controversial immigration policy, including, the president-elect has promised, the imminent deportation of millions and the construction of a wall along the southern border. Kelly, not unlike Trump, has expressed misgivings about “criminal organizations” exploiting paths along the border to reach the U.S. and has warned that such groups could eventually aid terrorists. 6. Kelly did not openly endorse Donald Trump at any point throughout his campaign. He previously suggested that he would willingly serve in a Republican or Democratic administration. 3 min 31 sec ago. 13 min 19 sec ago. 25 min 12 sec ago. 31 min 30 sec ago. 45 min 9 sec ago. 49 min 8 sec ago. 50 min 43 sec ago.